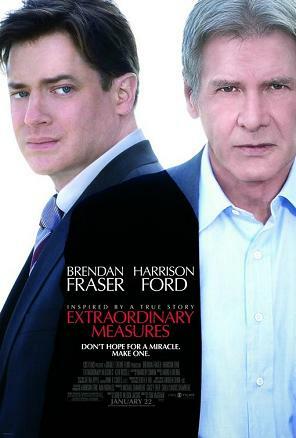 The new Harrison Ford film, Extraordinary Measures, hitting UK cinemas from 26 February, is a fictionalised account of the development of a treatment for Pompe disease, a rare genetic disorder. Pompe disease (glycogen storage disease type 2, acid maltase deficiency) is an enzyme deficiency with devastating effects – progressive muscle weakness and, in the severe infantile form, gross enlargement of the heart. Until fairly recently, the infantile form of the disease was invariably fatal within the first year of life. Now, however an effective treatment is in place. While the increased awareness that the film’s fictional account brings is very welcome, the real story of how that treatment came about is a fascinating one (1) and laboratory animals play a starring role. The long road to a treatment started in 1932 with the first observation of the disease by Dr JC Pompe, after whom it is named. Pompe described accumulation of glycogen in muscle tissue, which was a puzzle, as the enzymes involved in the usual metabolism of glucose and glycogen were all present and correct. The solution to this puzzle had to wait until Christian de Duve’s 1974 Nobel Prize-winning discovery of lysosomes in 1955. These cellular compartments or organelles are the ‘recycling units’ of animal cells. They have an acid environment and their own specific set of enzymes for breaking down cellular components. De Duve was carrying out ‘blue skies’ research, with no thought of direct medical application. However, as so often in research, a breakthrough in our basic understanding of biology led to medical applications. In this case, de Duve’s colleague Henri Hers realised that the deficiency of a lysosomal enzyme (alpha glucosidase) for the breakdown of glycogen would explain the symptoms of Pompe disease. This proved to be the case, and Hers established the principle of lysosomal storage diseases, of which around 40 have now been described, in 1965. Before moving on, let us note the role of laboratory animals in this breakthrough. I wrote to Professor de Duve and asked what part the use of animals had played in his work and he replied that “We would not have been able to make the discoveries we made without an extensive use of laboratory animals.”(2) - a statement confirmed by his Nobel Prize lecture. Having discovered the basis of Pompe disease, the next milestone was to develop a treatment. This proved to be very difficult, largely due to the lack of animal models. A recurring refrain from the animal rights lobby is that if the humane use of animals in medical research was banned, scientists would soon find other ways to ensure medical progress. That comforting belief is belied by the series of attempts, some of them pretty desperate, to treat terminally ill children over the next 25 years. None of them worked. The next great leap forward came from The Netherlands in 1990 and relied on the use of laboratory mice. Enzyme replacement therapy (ERT) had long been suggested as a potential treatment for lysosomal storage diseases but had never succeeded. In the case of Pompe disease, where large amounts of enzyme were needed in the muscle, introduced enzyme was simply soaked up by the liver. Two Dutch scientists, Arnold Reuser and Ans van der Ploeg, had the idea that phosphorylated enzyme would be taken via by the mannose-6-phosphate receptors in lysosomes, allowing the enzyme to be targeted. However the supply of phosphorylated enzyme was small – nowhere near enough to treat a sick child. How could efficacy be demonstrated, in the absence of an animal model? In an ingenious experiment (3), they used specific monoclonal antibodies to demonstrate that when bovine phosphorylated alpha glucosidase was introduced to mice, it was taken up by heart and skeletal muscle lysosomes and caused a significant increase in enzyme activity – a 43% increase in skeletal muscle and 70% in the heart. An increase that, if repeated in humans, would result in the level of enzyme found in the healthy population. With characteristic understatement, van der Ploeg et al concluded "...we think that the original idea of enzyme replacement therapy for treatment of lysosomal storage diseases deserves new attention." At last, thanks to this ground-breaking work, a treatment for Pompe disease was a real possibility. Now that there had been ‘proof of principle’ all that was needed was for a pharmaceutical company to spend millions of dollars in developing a treatment. Understandably perhaps, given the rarity of the disease and the inability to demonstrate actual efficacy, there was no immediate rush. Fortunately, at this point two animal models became available that allowed scientists to demonstrate that not only did the phosphorylated alpha glucosidase make its way to the lysosomes, it also had a beneficial effect. From 1998 onwards, transgenic mice with Pompe disease, developed in Rotterdam and elsewhere, were used to demonstrated the efficacy of alpha-glucosidase enzyme. At the same time the potential of ERT was also illustrated, more dramatically perhaps, by YT Chen at Duke University, using quail. The quail had the same enzyme deficiency as found in humans, resulting in muscle weakness. After injection with the enzyme, they recovered to the extent of one subject actually flying around the lab (4). The evidence was therefore now pretty convincing – it was time for human trials. The big problem was in producing enough enzyme for humans, even for babies. This required substantial industry investment. Two rival approaches were tried. A Dutch company, Pharming, produced the enzyme in the milk of transgenic animals for use in a trial led by Ans van der Ploeg, whose PhD research had led to the original breakthrough. The transgenic animal used was the rabbit, on the grounds that a human alpha-glucosidase-producing line could be established quite quickly. This work was used in a successful clinical trial, the results of which were published in The Lancet in July 2000 (5). Another trail was carried out by YT Chen, using enzyme produced via Chinese Hamster Ovary (CHO) cell culture, by Synpac, a Taiwan-based company. This trial was also successful. What follows next is a slightly convoluted story. The short version is that a third company, Genzyme, with an existing enzyme replacement therapy for Gaucher disease, bought out both Pharming and Synpac. In the end, they didn’t use either of the enzymes produced by these companies but developed their own, in-house CHO product, now marketed as Myozyme. This was a difficult decision – how could they decide which of the competing products should be invested in to produce a commercial treatment? The answer was what Genzyme called “The mother of all experiments” which compared the different products in transgenic Pompe mice. The result led to the availability of the treatment we have today. However, the eventual production system is a technicality that need not concern today’s patients. Their concern is that an untreatable, terminal illness is now treatable. If you go and see Extraordinary Measures do bear in mind the starring role that doesn’t appear in the cast list – that of the mice and quail that made this treatment possible.